Our FSRC race directors quickly learn that races have a lot of moving parts. We form our committees. We puzzle over promotion, sponsor recruitment, registration, shirt selection, course design, awards, and the all-important post-race food. And we worry. About registration numbers, shirt sizes, volunteers and – will runners like the race? What if no one signs up?? What if they come and hate the course (or the shirt, or the food) and trash the race on facebook?As you’ve stood at the start of a race, or triumphantly sprinted (or barely crawled) across the finish line, have you ever considered what has gone into the planning and execution of the race? No? Well, I hadn’t either. And then I somehow became intrigued with the Frederick Women’s Distance Festival. When race director extraordinaire Peggy Waxter was ready to give up the reins in 2014, after years of putting on the race, I took a deep breath and offered to step up. After months of planning, race week inevitably arrives, and we move smoothly through the to-do list. The runners are signed up, sponsor checks have cleared, bibs are prepared, and we obsessively check the weather forecast. LIttle crises are managed and everything actually goes well on race day. The runners are inspiring across a wide pace range and the volunteers make it all happen. Success achieved through teamwork towards a common goal is pretty awesome! 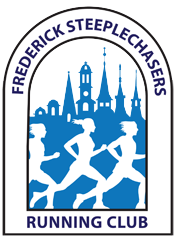 Our primary objective is to offer affordable and high-quality races to the running community, but we are also proud of our secondary objective of raising funds for the Frederick community. In 2017, the FSRC races had over 1,500 finishers and our signature races raised close to $50,000 for local nonprofit organizations and Steeplechaser community projects. 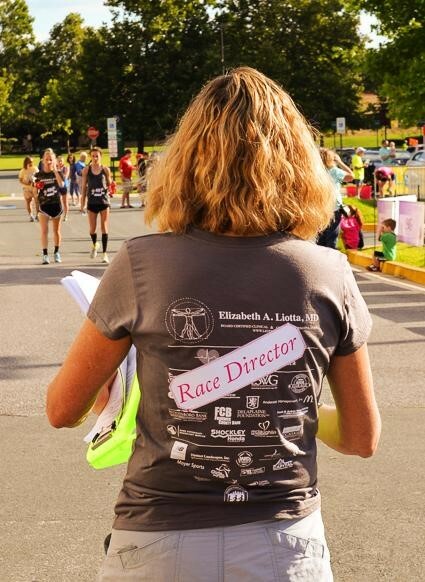 We’re always looking for race committee members – folks who will take on a chunk of race planning and execution such as registration, promotion, volunteer management, etc. If you are interested in learning more about race management, I’d be happy to talk with you. I can be contacted at harriet.langlois@steeplechasers.org.